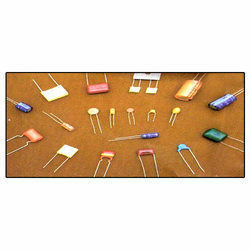 We hold expertise in trading and supplying qualitative range of Electrolytic Capacitors. Our products are available in different technical specifications and can be customized as per the demands. These products are widely appreciated among the clients for its high reliability and long functional life. They are designed and developed as per the international standards of quality. Kanchan Industrial Electronic was established in the year 2005 as a sole proprietorship firm at Bengaluru in Karnataka, India. We are engaged in trading and supplying a diversified range of Industrial Electronic Components and Panel Accessories. Our products range encompasses Fan Grill Guards, Electrolytic Capacitors, SMD Resistors, Metal Film Resistors, Network Resistors, Electronic Fuses, Toggle Switches and many more products. These products are highly appreciated for their reliability, low power dissipation, high efficiency, longer service life, easy usage and market leading prices. To set up an effective power supply network, our products hold a significant role. We ensure that products offered by our quality approved and thus, help in the development of reliable electronic circuits.